Mandatory Flight Check (or, The Importance of ATGATT) | welcome to the janniverse. 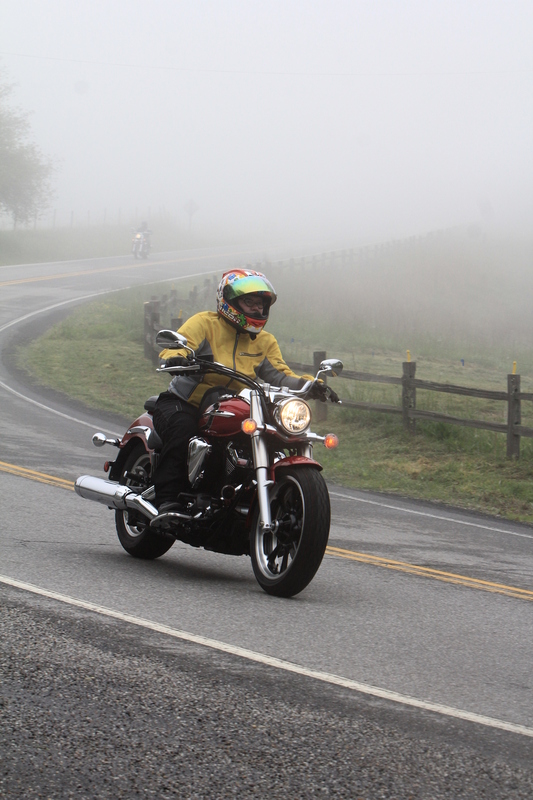 If you’ve ever taken a motorcycle safety class, you probably already know about ATGATT. If not, it’s a simple acronym for “all the gear, all the time,” which is how you can help ensure your safety whenever you ride. I liken it to a flight suit, or astronaut gear. You wouldn’t think of climbing into a plane or a shuttle without donning the proper safety attire, would you? Since motorcycles are the closest thing you can get to flying without leaving the ground, I think the same rules apply. When you choose to ride, there’s a certain amount of danger involved. That’s probably a good reason why some of us ride. But you can mitigate it somewhat by taking safety classes, learning how to ride defensively, giving yourself enough space and time to react to adverse situations as and if they should arise, and always wearing proper safety gear. I get asked a lot about my gear, especially during the really hot days of summer. “Aren’t you hot?” “Can’t you wear something cooler?” “Why do you wear all that stuff, anyway?” I hear variations on these questions all the time, as though people can’t believe I’d put my personal safety above my perceived momentary discomfort. Here’s my thing: while motorcycle gear in years past used to be limited to a black leather jacket (without any armor), a pair of jeans, and a small selection of helmets and gloves, those days are long gone now. There are loads of motorcycle gear manufacturers, to meet every type of taste and budget. Not only that, there are loads of different types of gear – from stuff for the coldest of winters to the hottest of summers. Don’t like leather? Wear Kevlar-reinforced textile gear. Like leather, but think it’s too hot? Get a fully perforated summer leather jacket, take it for a spin, and get back to me. Have a track day coming up in the hottest of hot summer weather? Get a one-piece suit that fits you, with an aero hump on the back and perforation everywhere. As long as you’re moving, you’ll feel like you’ve got built-in air conditioning in some of those suits. A one-piece racing suit is overkill for regular street use, I admit. And not everyone has money for one of those, anyway – even if you do find a killer deal from someone in your area who’s selling it on Craigslist. That’s why reinforced mesh textile gear exists. True, it’s not going to hold up to as much abuse as leather. But a well-crafted piece of textile gear, particularly with some armor in it, will still offer a whole lot more protection than your t-shirt and jeans. Or your shorts. Or your cute little bikini top. Armor helps prevent joint injuries, but all the fabric that holds the armor in place helps prevent nasty road rash. On sunny summer days, it also helps to prevent sunburn and to keep you hydrated. The greater the perforations or mesh content of your gear, the more the air can flow through while you ride. Pair that with some moisture-wicking athletic gear, like t-shirts or tights (you know, marketed toward runners and cyclists), and you have a winning combination of comfort and safety. Boots, gloves, and a good helmet that fits your head comfortably are essential parts of this philosophy. As far as the expense goes, I look at it this way: yes, this stuff costs money. But like anything else, you can bargain hunt to find the best deals on good gear. Check closeouts at places like MotorcycleGear.com for incredible deals on a regular basis. If you’re lucky enough to have a good local motorcycle gear store, check there for sales and clearance items – particularly when products get discontinued. I recently scored a deal on a pair of Dainese Hellfire Evo gloves because they’ve been discontinued, and they’re some of the nicest gloves I’ve owned. The key is keeping your eyes open and being ready to act. I only just realized that almost every piece of gear that I own was purchased at a huge discount. I’m not made of money, but I value my safety. The fact is, you may be the best rider in the world. But that doesn’t mean you can control everyone and everything else around you. If you’re gonna go down, make sure you do it in a way that ensures you’ll walk away with no or very minor injuries in small crashes. I and several people I know have gone down at least once, with varying degrees of injury. Guess who I know who wears gear? If you guessed “anyone who’s been down,” you’re right. You won’t die of road rash (well, unless other factors are involved), but it’s an experience you won’t want to have twice. Wearing gear can help you avoid ever having to go through it at all. Since comfortable gear does exist for all seasons, why not keep yourself whole and healthy so you can spend as much time on your bike as possible? I really don’t see why that’s so difficult to understand. Sure, depending on your local laws, it’s your right to ride without any gear whatsoever. If you choose to do so, I wish the best of luck to you, and hope you never find out what it’s like to fall without gear. But just know that you’re making a personal decision – not because there isn’t gear available for your situation, but because you choose not to wear it. Again, your choice – but there’s so much gear available now, if you’ve been riding without because you think there’s nothing for you, I’d suggest you take another look. Times – and gear – have changed. [ETA: Was just sent this helpful video demonstrating some stupid crashes with — and without — proper gear. On scooters, even. Just because it doesn’t have as much power or speed as a higher-displacement motorcycle doesn’t mean you can’t get hurt.